Our refractory Silicon carbide kiln shelf can offer high mechanical strength at high temperature, excellent heat stability, good distortion resistance at high temperature and oxidization resistance. It can be used in high class washing basin, high-class bowl and bowl urinal. Through the burning of 1300°C, it provides high enamel and high abrasion resistance. It can keep gloss and quality for 10 years. sic kiln shelf enjoy good reputation in this trade. We are improving our product and introducing green into our sales activity. 1. The storage spot of SiC refractory materials should be kept tried, away from mist and wet. 2. Do not pile the SiC refractory materials on the top of another, it is preferable to put them in a vertical order. 3. After the SiC refractory materials plate is sprayed with alumina solution, it should be laid dried around the kiln before use. 4. To get longer useage and avoid damnification, the SiC refractory materials should lay dried and put on the refractory plate. 5. After the products is glazed, the bottom of glazed product should be cleaned. 6. When building refractory plates, the refractory supporter should be aligned. 7. 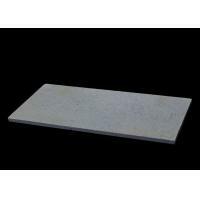 The distance between refractory plates should keep upon 14-20mm. 8. The design of sintering curve should meet the requirement of normal operation. Avoid heating or cooling in a short time. 9. When cooling takes place, it should be cooled gradually, avoiding exerting cold air to get a fast cooling. 10. When moving from the kiln, one should avoid carrying it at high temperature or hitting. We use plywood box & pallet to pack Refractory Silicon carbide kiln shelf, it is very safe.We have professional logistic company, they can deliver to any port in the world and they can offer very good price.